Some people call me Scrooge.. or the Grinch, because around the holiday season I love to give gifts, but I don’t like getting them. See.. there’s a story to tell.. When I was a little lad, my family was pretty poor.. we didn’t have money for anything.. food was scarce, toys were even more scarce. My “laser gun” was a piece of wood that I drew details on. Christmas was usually a day spent in church, thanking god for what we DID have.. family, friends, health, yadda yadda. If we DID get toys, they came from the Salvation Army and, though they meant well, they were crap. Some that stuck in my mind was a solid plastic horse.. forever stuck in mid-gallop.. and a wooden race car.. the wheels didn’t even move. Of course, me being the brat that I was, I never said thanks, I threw a tantrum for not getting a “real” toy.. I’m surprised my parents never flushed me down the toilet. Eventually my eldest brother, 5 years older than I, started to work. So one Christmas he used some of his paycheck to buy me a present.. he bought me a Transformers Galvatron action figure.. it was cool.. his gun sparked, he transformed.. a “real” toy. However, that particular Christmas, we had family unexpectedly drop in from out of town. 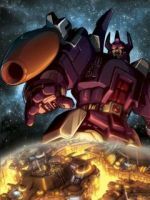 It was my aunt with my male cousin who was roughly the same age as me.. lucky me.. my mother was so distressed that she hadn’t bought them anything that she took my Galvatron away from me and gave it to my cousin. Merry Frickin Christmas. Since then.. I’ve always felt awkward getting gifts.. I dunno why, maybe the fear of losing it.. or maybe knowing someone else could use it.. who knows? Anyway, I tell this story a lot.. not for sympathy or anything, just that I have to explain to people why I don’t want to get gifts. Apparently the story sticks with people.. last year for Christmas I got an Optimus Prime action figure.. and this year I received a Megatron action figure. While I’m thankful, it still doesn’t feel right to get gifts, especially Transformers. Each one comes with a little sting to my soul. I ask that if anyone can, and wants to, go back in time to when I was a kid and get my cousin a Transformer.. preferably the Galvatron. That way, when my mom tries to give him mine, he’ll say “I already have it.” …and I’ll be able to love Christmas as much as the next guy. I feel the same way. I absolutely love to give and give but I feel bad when people give stuff to me.